Fr. a: shank square in section; wide flaring head. p.L. 0.067 m.
Fr. b: shank square in section; wide flaring head. p.L. 0.055 m.
Fr. c+d: small spike with shank square in section; rectangular head. p.L. 0.046, Th. shank 0.010, p.W. head 0.31. Fr. e: small spike with shank square in section; rectangular(?) head. p.L. 0.027, Th. shank 0.014, p.W. head 0.026. 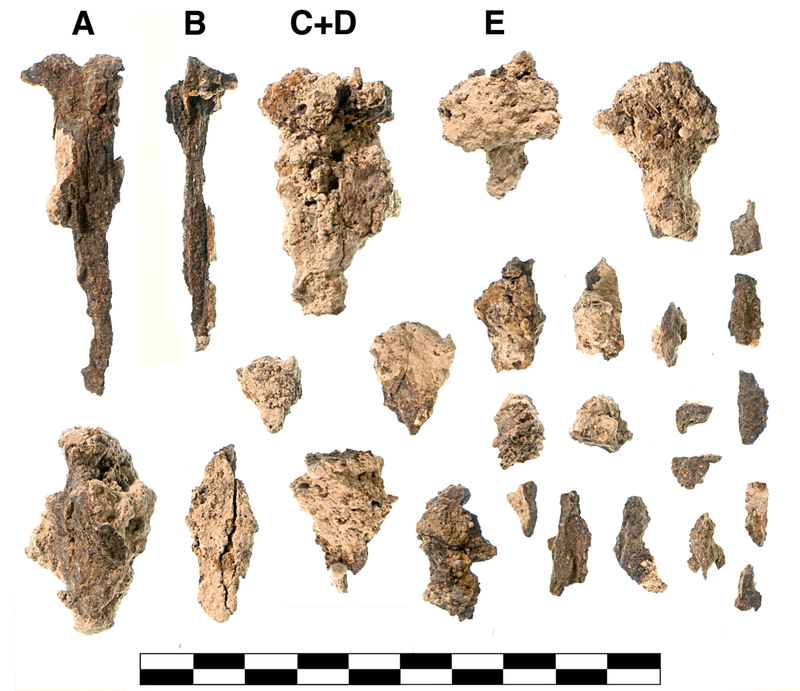 Four fragments of shanks and heads represent three nails (a-c); 22 more small fragments and flakes from similar objects. Heavy corrosion and splitting.